“Shark infested waters” isn’t a term you normally associate with the Irish coastline, yet in late spring and early summer the Irish coast is one of the best places in Europe to see one of the world’s largest sharks. The basking sharks (Cetorhinus maximus) is the largest fish in the North Atlantic, and second largest in the world (beaten only by its slightly larger tropical cousin, the whale shark Rhincodon typus). In spring and early summer these huge, harmless plankton-feeders arrive in numbers around the Irish coast, and can be seen from Mizen Head in the south to Malin Head in the north, sometimes just metres from the shore. A basking shark off the West Cork coast photographed by an Ireland’s Wildlife Tours guide. Description: The basking shark is a large slow-swimming filter feeder that fuels its enormous bulk by sieving tiny plankton through specially adapted “gill rakers”. It has the distinctive torpedo-like body shape typical of open ocean sharks, with a conical, almost pointed snout, large dorsal and pectoral fins and a crescent-shaped tail. The body colour can vary, but is typically a dark grey-brown, although it generally looks black when viewed from above the surface unless you see a shark at very close quarters. The typical view of a basking shark is of the dorsal fin, the tip of the tail, and occasionally the tip of the snout, breaking the water’s surface as the shark moves its massive bulk slowly through the water hoovering up plankton. Top Tip: Understanding more about basking sharks will improve your chances of seeing one. Start with the basking shark species profile here, then check out the links at the end of the article for more information. Although there are always early and late sightings, basking shark season in Ireland starts in April and runs through to late July / early August, typically peaking from mid May to mid June, with fantastic opportunities to spot sharks from boats and from land during that period. Sometimes they venture very close to shore as they follow aggregations of zooplankton into shallow bays and inlets. Calm weather after a period of sustained sunshine in May or June will generally maximise your chances of spotting a basking shark. Calm seas make it easier to pick out the tell-tale dorsal fin as it breaks the water’s surface, and fine weather boosts phytoplankton production, which in turn increases the concentration of zooplankton at the water’s surface, attracting the sharks up to feed. Distribution map showing reported basking shark sightings around Ireland for 2011 (IWDG / ISCOPE). Basking sharks concentrate wherever there is an aggregation of the zooplankton they feed on and can occur anywhere around the Irish coastline during the spring and summer months. 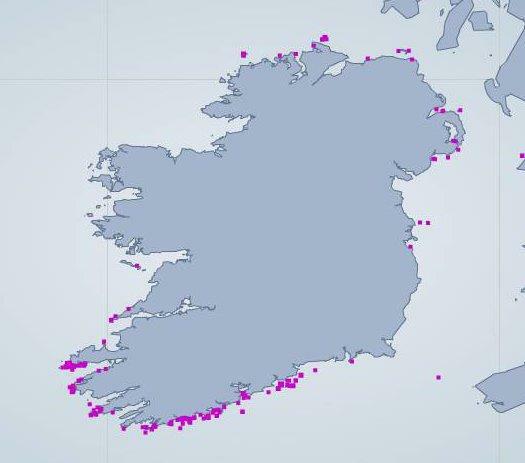 However, the acknowledged basking shark hotspots are the south coast from West Cork to West Kerry, and the North West coasts of Mayo, Sligo and Donegal. Top Tip: Check latest basking shark sightings on the Irish Whale and Dolphin Groups online sightings database for the low-down on where sharks have been spotted near you. While you can see basking sharks from the beach, you’ll improve your chances enormously if you choose choose a site above sea level. Any site with a good view over a large expanse of water is suitable. Headlands are ideal, as they give an expansive view of the open ocean, but also let you scan bays and inlets along the shore for shark activity. Choosing an elevated site will give you a “birds eye” view and, when conditions are right, will allow you to see more of the shark just beneath the surface, rather than just the tip of the dorsal and tail fin. Top Tip: Don’t forget to scan bays and inlets close to the shore — sharks often come into shallower water to feed on gathering plankton there. All you really need to spot basking sharks is keen eyesight, a bit of patience, and enough knowledge to put yourself in the right place at the right time (this article should help there). However, there are a few things that can improve both your chances of seeing sharks, and the quality of the views you get of them once you find them. Time and perseverance: as with all wildlife watching, practice is the key to picking out basking sharks at the surface… so get out as often as you can during shark season when conditions are right, and keep looking. A camera: to record the moment on those special occasions when sharks venture close enough for some shots. Like all wildlife sharks can be unpredictable… but if you put yourself in the right place, at the right time of year and in the right conditions there’s a good chance that, sooner or later, you’ll pick up feeding basking sharks. You’re also likely to spot other exciting marine wildlife — like seals, seabirds, dolphins and perhaps even the occasional whale or two. Basking sharks photographed in West Cork, Ireland by Pádraig Whooley. Diving gannets: aggregations of gannets gather over shoals of the fish they feed on. Typical gannet-sized fish often eat the very same plankton that basking sharks are feeding on — so the birds are a good indirect indicator that there could be sharks in the vicinity. Tidal fronts: oily looking slicks of water off a headland or at the mouth of a bay on a calm day are caused by tidal fronts where warm water meets significantly cooler water. These fronts attract plankton and Basking sharks often feed along their length, passing back and forth in a zig-zag pattern. Flashes of sunlight: the almost black dorsal fin of the basking shark is very “shiny” when wet, and acts like a mirror. On sunny days look out for glints of light reflecting off the fins of sharks feeding on the surface. Top Tip: remember that other animals like dolphins, whales, seals and even black seabirds like shags and cormorants can look surprisingly “shark-like” in some circumstances, and beware of floating buoys, lobster pots and other debris on the surface. 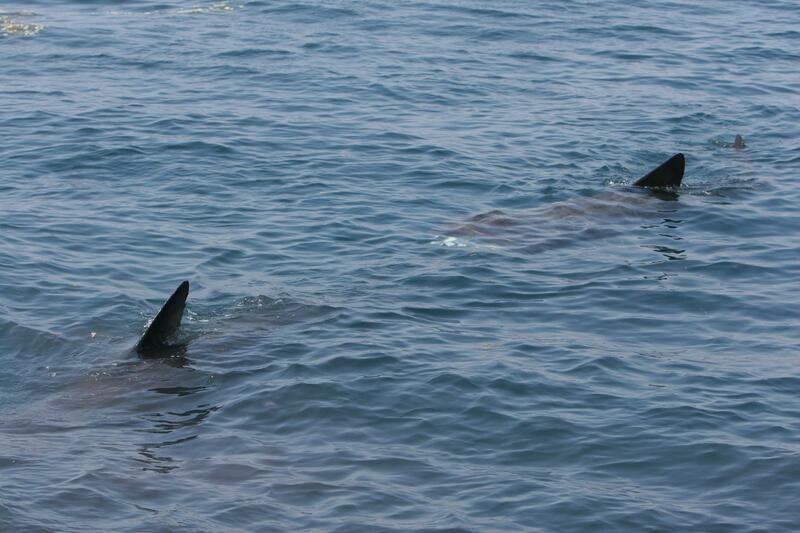 Close up views of Basking Sharks with Cork Whale Watch on one of our Ireland’s Wildlife Tours. The best way to get close up views and photographs of basking sharks is to go out on an organised boat tour with a whale watching or marine eco-tour operator. You’ll find a selection of operators at marine wildlife hotspots right around the country. Your local tourist office should also be able to advise on a reputable local boat operator who offers marine wildlife trips. Getting out in a boat to see basking sharks is one of Ireland’s wildlife highlights — you only really appreciate the size of these magnificent creatures when you get close to them out on the water. When you do see sharks please report them to the Irish Basking Shark Project. The IWDG manages their sightings scheme for them, so you can submit your basking shark sightings using the IWDGs standard online sightings form. All reported shark sightings help yo build a body of data that will inform shark conservation and research. Do you have any tips to share on watching basking sharks in Ireland? Or perhaps you have an interesting basking shark story to share? Let us know in the comments below — or head over and share with the Ireland’s Wildlife community on Facebook…. An awful big flutterby . What a thrill so long as you feel safe . Didn’t know we had such things round Inishowen . Is it safe to swim beside them as it is with whale sharks? 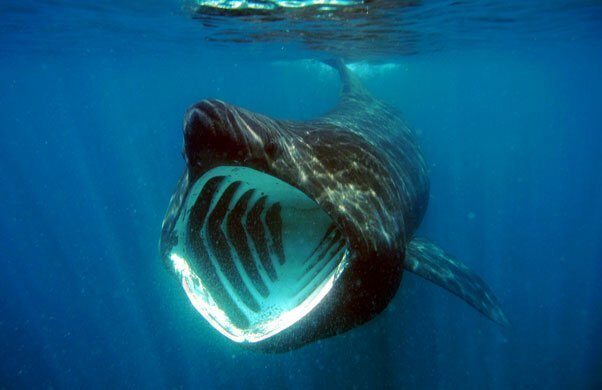 Basking sharks feed in exactly the same way as whale sharks… by filter feeding on plankton they extract from the water column through specially adapted gill rakers. So there’s no danger of a basking shark actually attacking you, however they are big, powerful animals, and an unintentional collision or whip of the tail could cause serious injury. I’d generally advise people to think very carefully before getting into the water with any of our marine megafauna.